Many colleagues do not use MBSE tools and are much more happy reviewing PowerPoint slides. Additionally, sometimes diagrams can be forgotten about through the course of modeling different system aspects and can be affected by changes in element attributes. 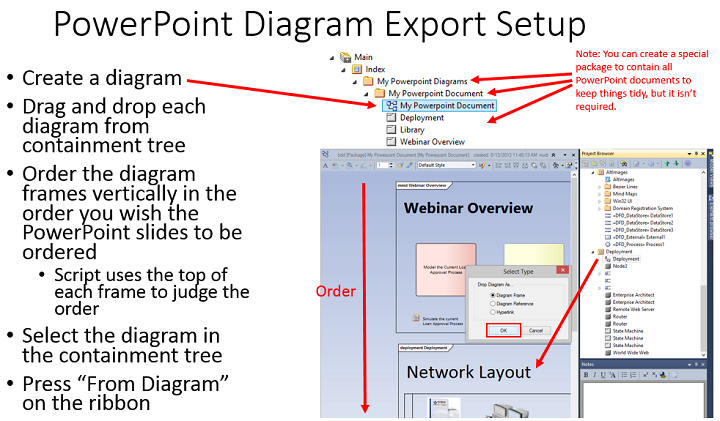 This tool allows you to quickly export Enterprise Architect diagrams to a PowerPoint artifact for review. 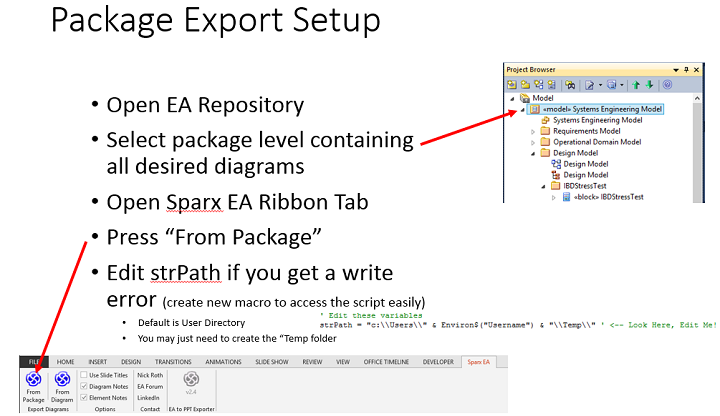 The tool is integrated into a base macro-enabled PowerPoint artifact, including a series of visual basic functions to perform the export, while utilizing Geert Bellekens EA Connect model from his Simple VBA Excel to EA Importer. There were minor edits made to his module to extend it to retrieve diagrams in a recursive manner, including those that are nested underneath elements. Some minor functions that did not exist were added as well. The tool provides a custom ribbon where all options and functions needed can be executed without directly executing the macros. ExportEAPackage - One of the two primary functions. This function exports all diagrams that are beneath the selected package in the containment tree. ExportEAPowerpointDocument - The second of the two primary functions. This exports a diagram that contains an ordered set of diagram frames as a "virtual" PowerPoint artifact. 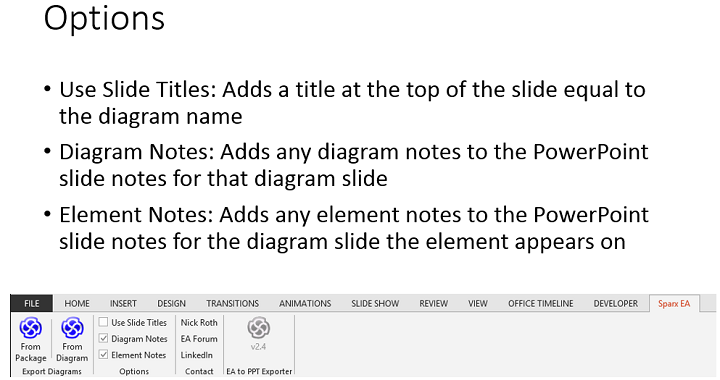 This function relies on the user to order the diagram frames from top to bottom in the way they want them to appear in PowerPoint. The script uses the location of the top of each frame to determine the order. ImportImagetoPPT - This function is used by both main functions to actually take an already saved diagram, load it into PowerPoint, then scale it to best fit into the available space. It additionally will save the notes for the diagram and all elements within a diagram into the PowerPoint slide notes. FormatNotes/StripHTML - This function formats the entire note to go into the PowerPoint slide notes from all of the individual note components that are associated with the diagram. This includes handling elements without notes or notes that have html formatting. Temp Folder - If you receive a temp folder error, make sure you create a folder named "Temp" in your user directory. Diagram Names - I have tried to handle strange diagram names that would mess up the image path, but this is something that could be an issue. Ribbon Not Showing - If the ribbon does not show then make sure you have enabled macros within PowerPoint options. If you computer is locked down by your employer, then the ribbon may not show up. In that case you can add the "Developer" tab to access the Visual Basic editor. At that point you can remove the iRibbonControl argument to the functions you want to run, then you can use them in the normal way through the macro menu.